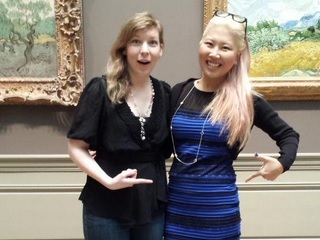 Ko Im pairs black and blue with The Met and New Jersey. Solid social experiment by Bustle’s Ko Im. After purchasing that infamous black and blue number (it still retails for under $100), she wore it around Manhattan and New Jersey this past weekend. It’s crazy to think that the design has become so ubiquitous, like a Van Gogh masterpiece hanging on the walls of the museum. Our guide even made an announcement that I was wearing The Dress. “I knew it,” someone in the group muttered as she snapped a picture with me in front of some great works of art for Twitter. And while the Tweet will last forever, I know this moment and the popularity of the dress will fade with time like the slow color shifts on the canvases. To find out about the other fun reactions and interactions caused by Im’s wardrobe choice, on the subway, at a New Jersey baby shower and beyond, click here.